Third grade Armed Librarian. He has green hair and usually wears the robes of an Armed Librarian. He has a strong sense for justice. He has mastery of his weapon, the bladed discs, for offense or to float on and the special ability to create illusionary clones of himself. His fighting style is to create multiple illusions and quick movement between them supplemented by a bombardment of flying bladed discs that is offensively powerful while confusing opponents on which person/blade is real. 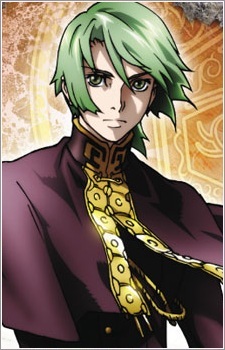 Because of his strong sense of justice, he began to doubt Hamyuts Meseta's actions. He eventually left the library, taking with him the Yluckluck, in order to find a way to free the Meats and dethrone Meseta. Because of his actions, the library names him a traitor. He eventually returned to the Library only to leave again with Renas Fleur aka Olivia Litlet in tow. He was stopped by his mentor and they fought on an island. The battle ended with Volken's victory, but his mentor was then killed and he got framed for his murder. Hamyuts then hunted him down and they eventually battle. At first, Volken seems to have the upper hand in the battle but he got distracted from Hamyuts revelation and he dies by her hand. He died knowing that the justice he believed in was all just a lie. His death however was not in vain as he was able to protect and buy Renas Fleur some time. In doing so, he allowed Renas, who was once a Meat, to grant her wish in returning all the lost memories of love of the Meats through the use of the ancient magic artifact, Yluckluck.